Granted that ravishing silk and designer sarees are the one that knocks us off when we attempt to dress up for special days, what many miss out is the fact that the same attractive look can be achieved through simple georgette sarees as well. 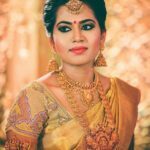 When silk and other heavy sarees might cost you a ton to get that grand look, georgette sarees on the other hand are often less expensive and would look more cooler and modern than any traditional sarees. Besides the fact that georgette sarees are less expensive than any other party wears, there are also few other positive points that always makes us favor this. Ease of maintenance, comfort and less time to drape it are other alluring things about opting for Georgette sarees. Also it needs to be noted that they impart a modern sophisticated look. 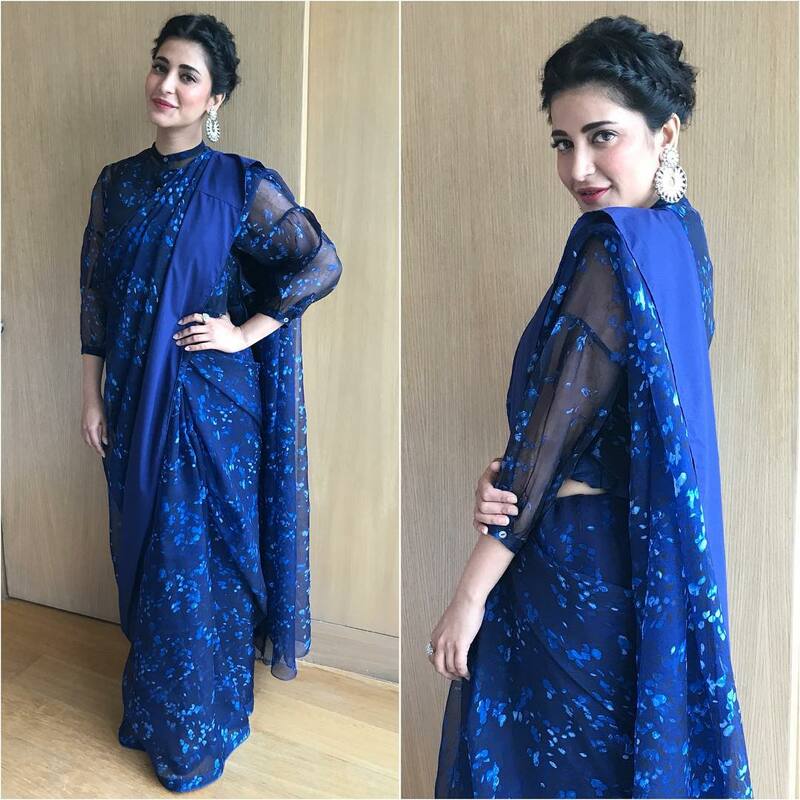 So, how to get the best georgette saree look? 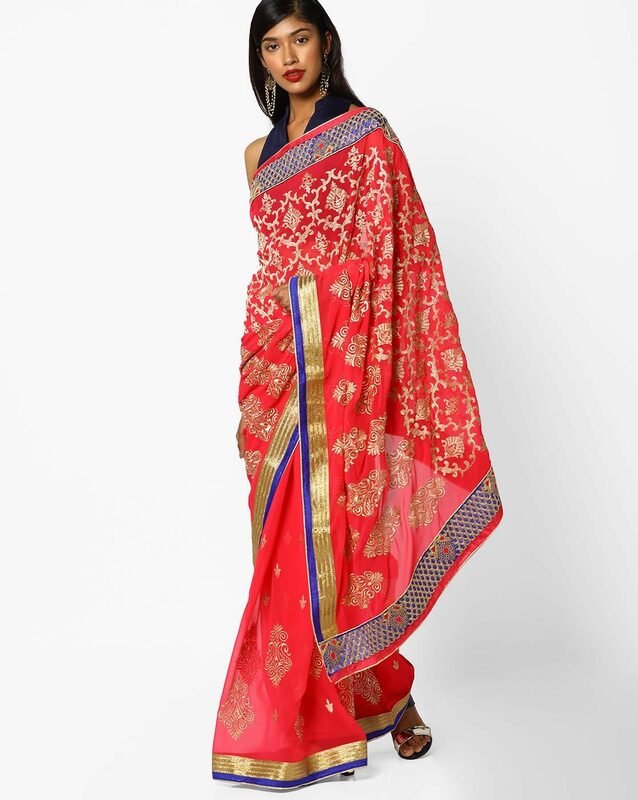 You need to be conscious on the choice of print and the embellishments you have on your saree. By opting for attractive prints with subtle embellishment like a simple zari or stone border, you georgette saree will flair better than any of its counterparts. Above all, you can give a modern spin to your plain georgette by opting for tons of cool designer blouses taking rounds on the fashion radar right now. So georgette sarees worn with designer blouse is best idea for those who want to look quite trendy without busting their month salary on some fancy designer sarees. Now let’s take a look on latest trendy georgette saree and designer blouse ideas to try this season. This is a kind of saree style that one likes to drape on farewell parties to friends outings. You can instantly seek the room of comfort on this relaxed sleeveless blouse. You can even wear it to your office and later with an addition of chic clutch can convert it into a party wear. 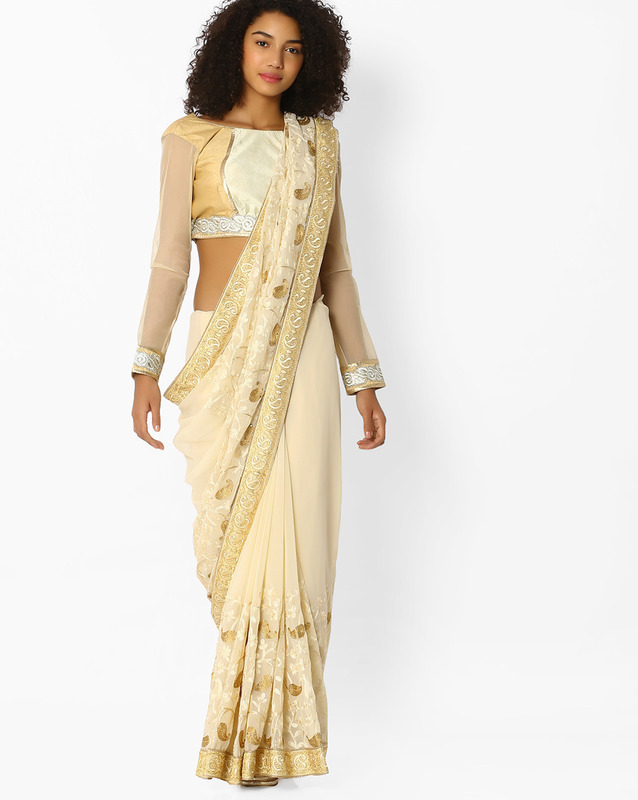 While a gold blouse is an absolute must have for all kind of sarees, why not try this with your georgette as well. If you want a stylish look, opt for long blouses with collar neck as below. Even georgette sarees with subtle gold prints can be made to look super stylish with a halter neck blouse. Finish this cool style with a pair of metallic pumps and a bold cuff. You can be sure that you have nailed your look. 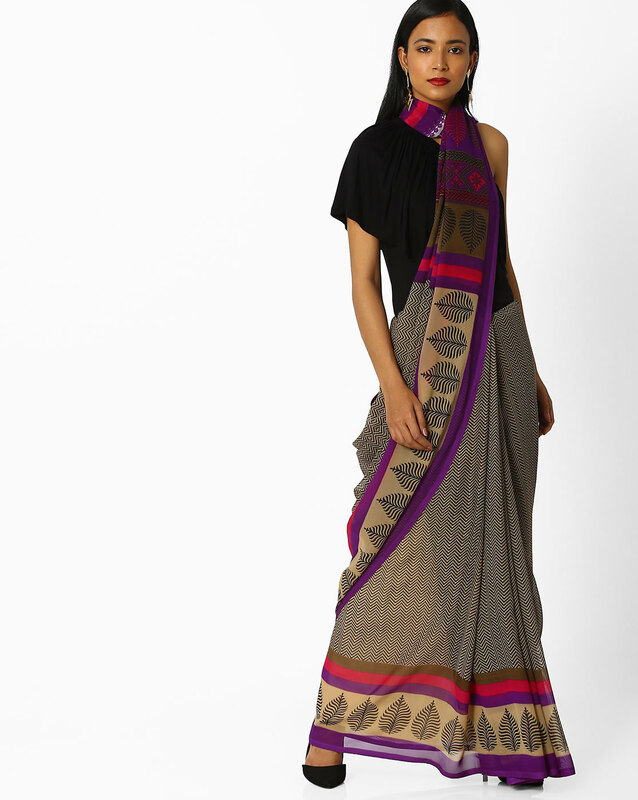 With a chic collar neck and elbow sleeve blouse, even a simple printed georgette saree would have a complete makeover. Add a metallic pumps and a huge dangler to round off this look. 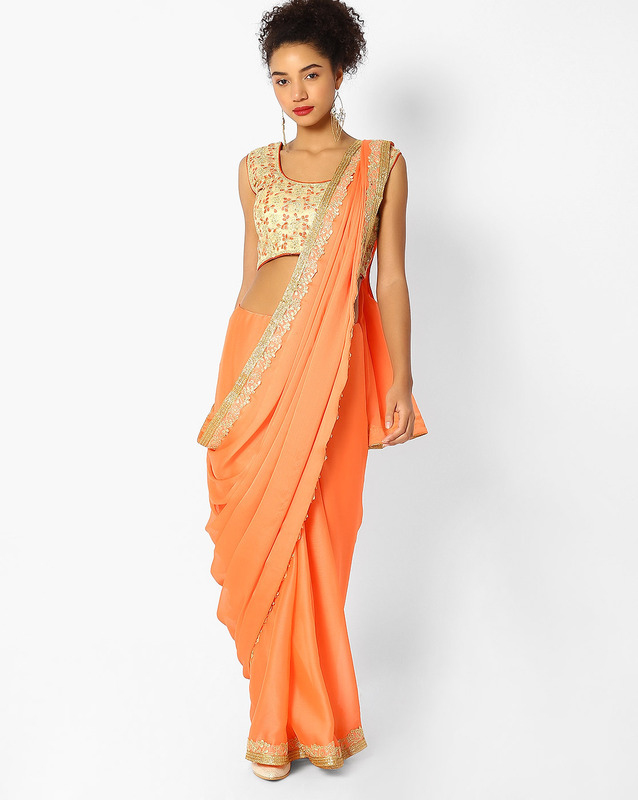 To give a party look to your georgette sarees, pair with elbow sleeve blouse with wide neck line. This is another gold blouse style that you can wear with any saree. If there is one fabric that gel wells with georgette, it’s the ever gorgeous net. Give your plain blouse a stylish spin by opting for transparent net sleeves. A sassy high neck black blouse will add a modish touch to your plain georgette sarees. Wear them with black pumps or stilettos to achieve a polished saree look. 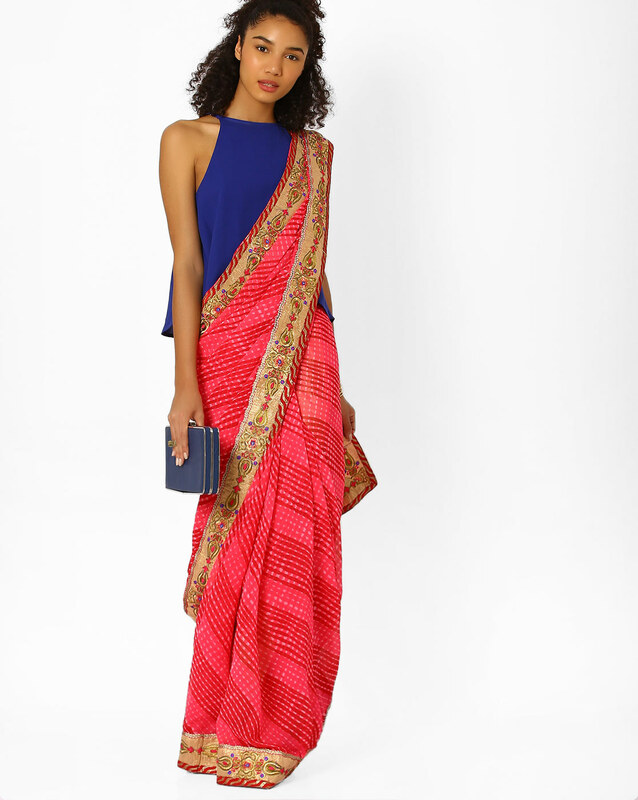 For a standout saree look, opt for bright georgette sarees and wear them with stark contrasting blouse like below. To add an edge, have a transparent yoke. 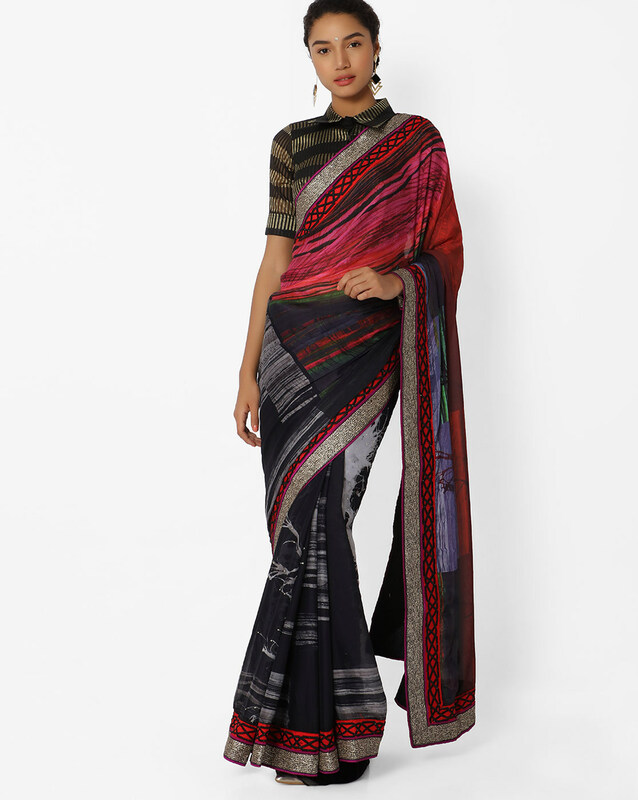 It would compliment your modern saree look. Even your plain raw silk blouse with long sleeve would do complete justice to your georgette sarees. 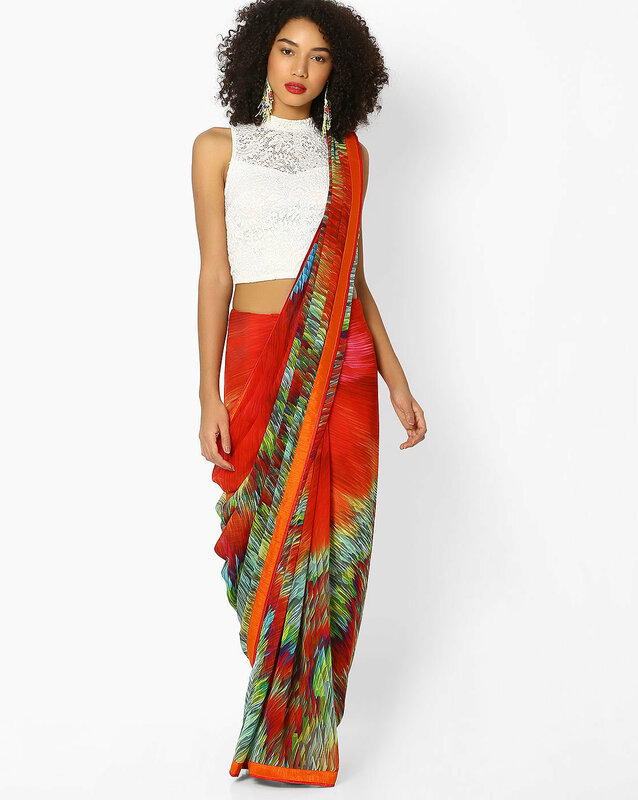 Chances are you might already own this model right now in your wardrobe for other sarees. Save the blouse cost and reuse it. 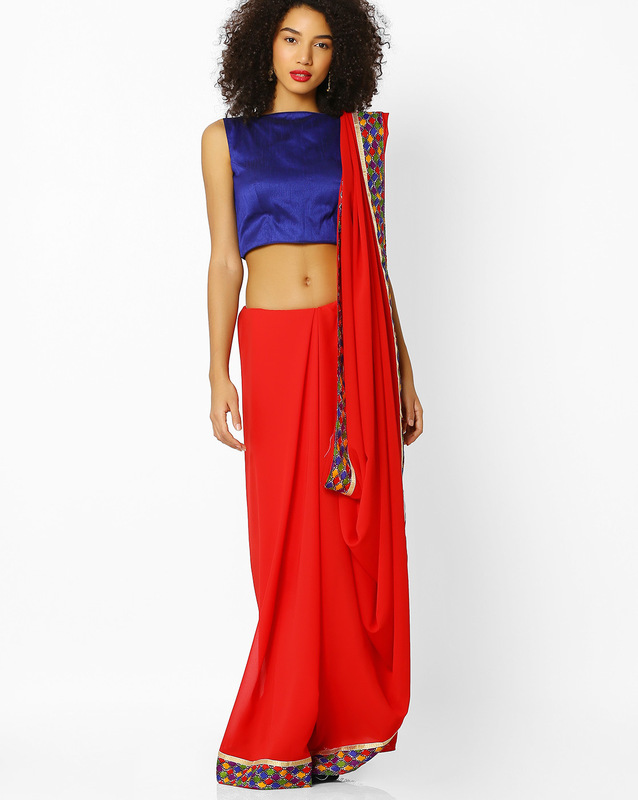 A chic collar neck with front buttons is another interesting way to make your georgette saree look cooler. Wear bold silver accessories and silver pumps to ground this look. Zari brocade blouse to silk sarees, is what a glittery sequin blouse would do for a georgette saree. Opt for wide blouse neck and get them embellished with lavish sequin work. This will look so magical when you actually wear it. If your saree is already crowded with too much of details, then go subtle with blouse. Opt for either simple satin or velvet blouse with close neck, and add a pair of danglers for a riveting look. 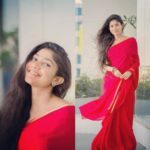 If you are in school or college right now, and want a practical saree look that won’t make you dread, then do give this ultra cool plain saree and boat neck blouse a try. 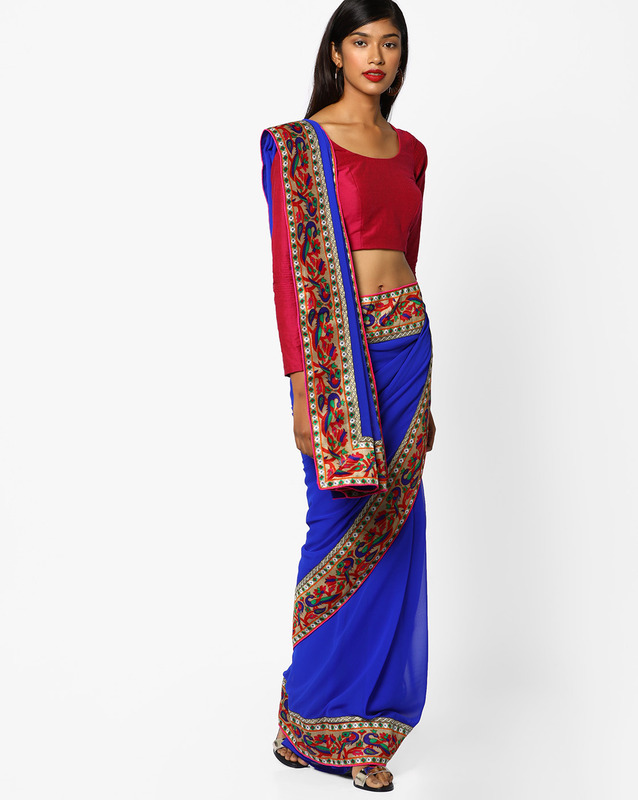 Add a turtle neck tops to your georgette saree and bring out that true fashionista in you. 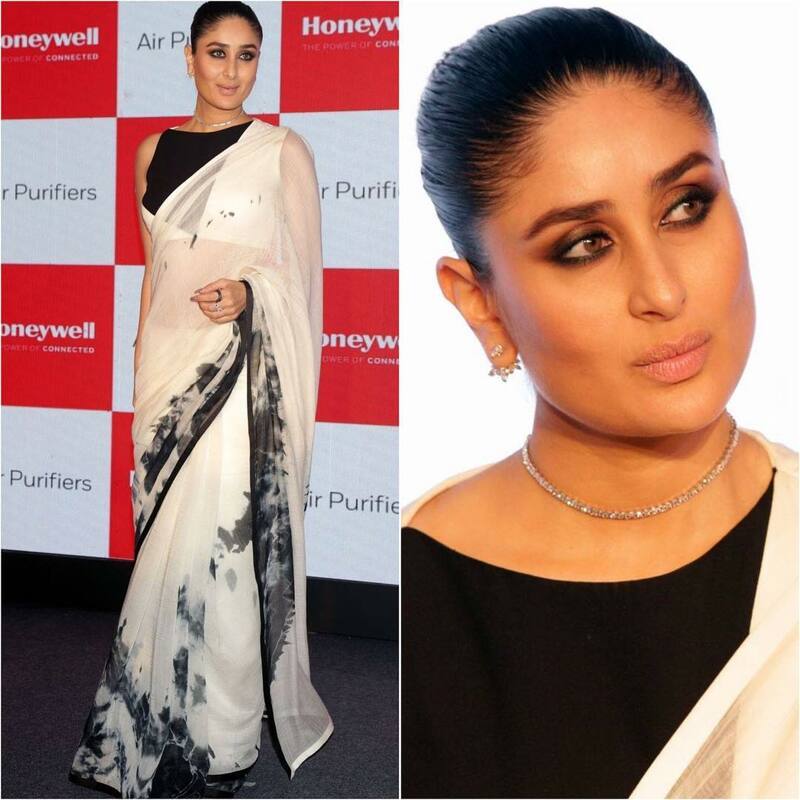 After all, trying out a fusion saree look will only excite you. Isn’t it? For milder pleasant shades, opt for a heavy work blouse with colorful details to add a edgy feel. Wear this with catchy accessories that grab the attention at the needed place. If the saree of darker shades like burgundy, teal, dark green, black..etc, one instant way to balance out the look is to opt for full embroidered blouse, with the thread work preferably in lighter shade. 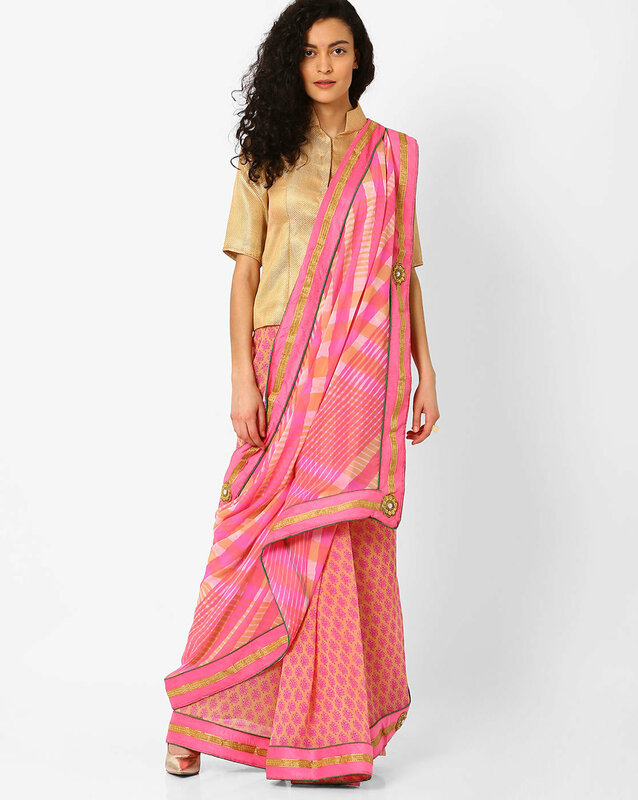 To take your printed georgette sarees to next level, pair with a sleek bell sleeve blouse. 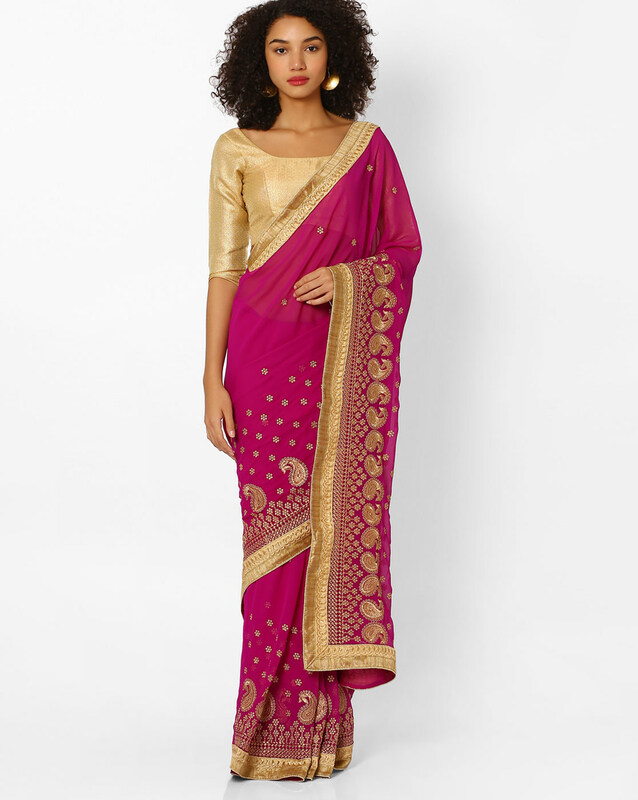 Who want to take your sarees for indo-western look? 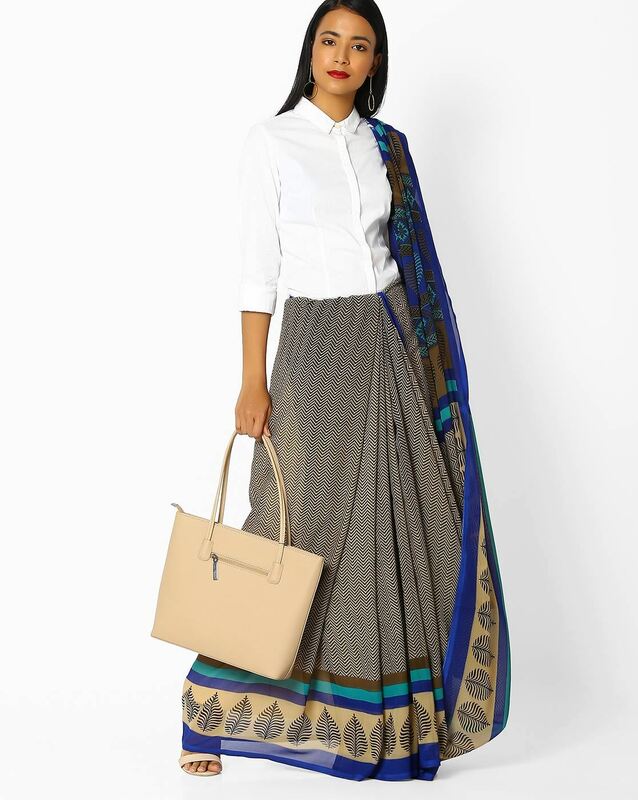 All you need to do is to wear your saree with a crisp white shirt and grab a statement accessory to compliment it. Those who seek modern and creative looks on your sarees should go for a one shoulder blouse like below. Wear this with pointed pumps and catchy bag to make others glued to you. To get a sophisticated saree look that can make your look more formal and professional, you can wear your saree with a crisp lace blouse like the one below. Going for a fun-filled party along with your fellow fashion crowd? 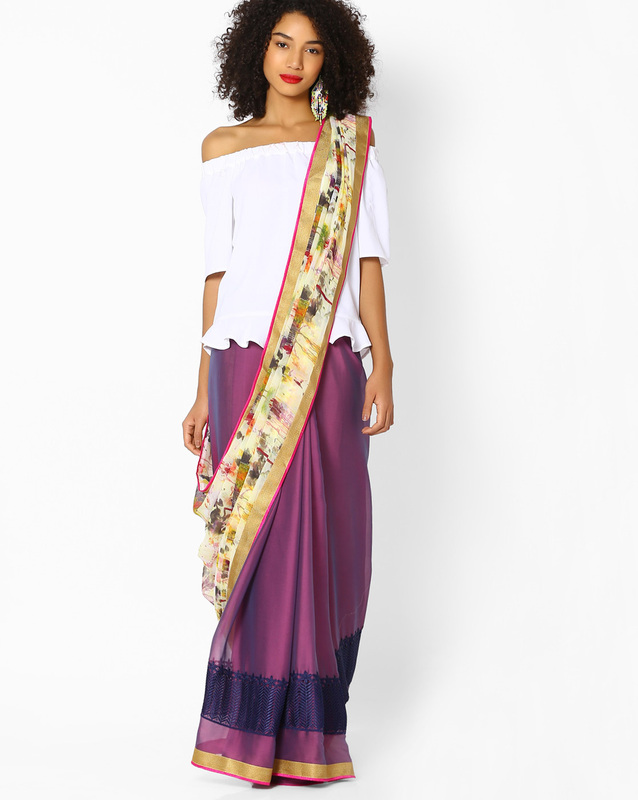 Want to stick on the budget, then do opt a quirky printed georgette saree with off-the-shoulder blouse. Bored of all the traditional blouse style? 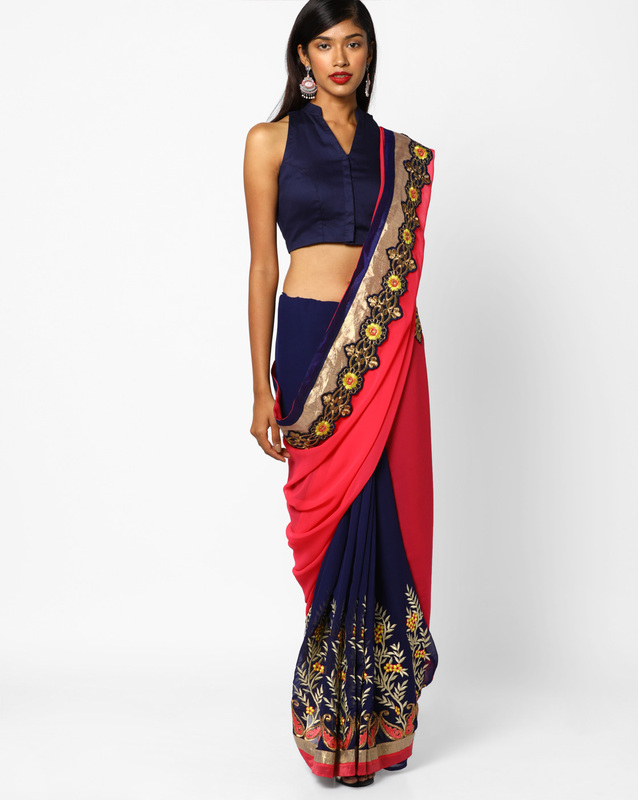 then for a super stylish moment, do grab your roomy jean top and pair with your saree. Oh for once, do break all the rule and embrace this fashion forward style. These are some of cool georgette saree and designer blouse ideas that can perk up your saree style. If you like to buy any of the above sarees, shop here. For once, give a miss to other traditional drapes and give this stylish combination a try. And do drop here and tell us how it turned out!